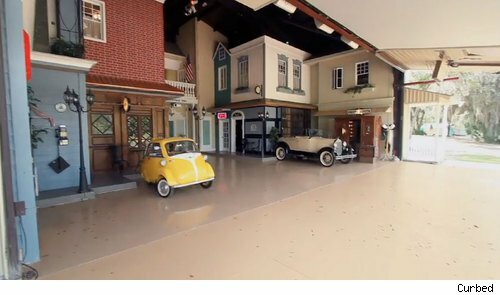 Meet Danville, a 3,000-square-foot airplane hangar-turned-1940s mini-town on a 25-acre property in Geneva, Fla. Conceived by retired contractor Dan Shaw, the utterly over-the-top home amenity, if you will, contains O'Shaw's Irish Pub, a working bar with a "kegerator"; the Danville Inn, a two-bedroom hotel with a custom kitchen, a lavishly decorated living room, and a balcony; and a 15-by-15-foot movie screen. Adding authenticity to the town are midcentury antiques, period-appropriate streetlights and phones, and windows sourced from a 1920s house. The best part of Danville is how you get in: With the push of a button, an otherwise nondescript porch -- actually a 2-ton door that cost $25,000 to install -- lifts off the ground and folds up.